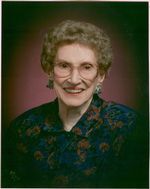 Nettie Kathryn Blansett, 96, of Paragould, died Monday, March 19, 2007, at Greene Acres Nursing Home in Paragould. She was born in the Water Valley community near Ravenden Springs, Ark., on Sept. 2, 1910, to William Joseph and Sarah Jane Smith Blansett. She began teaching elementary school in Randolph County after graduating high school at Pocahontas and later graduated from Arkansas State University with a degree in elementary education. Most of her 40 years of teaching was done at Cardwell and St. Louis, Mo. She was a member of the Paragould First Baptist Church, the Greene County Retired Teachers Association and the Delta Kappa Gamma Society. She was also a volunteer with the Hospital Auxiliary and the Greene County Literacy Council for many years. She was preceded in death by her parents; three brothers; and five sisters. Survivors include a sister, Hattie Hosman of Paragould; four nephews, Thurman Wells of Ravenden Springs, Leon Blansett of Jefferson City, Mo., Kenneth Rogers of League City, Texas, and Vic Hosman of Paragould; and a niece, Mildred Statlet of Columbia, Mo. Visitation will be Thursday, March 22, at 1 p.m. with funeral services immediately following at 2 p.m., at the Mitchell Funeral Home Chapel in Paragould, with Joe Marsden and Dwight Harrison officiating. Burial will be in the Cardwell, Missouri Cemetery. Bruce Davis, Larry Davis, Jonathon Davis, Chad Davis, Shad Rowe and Charles Nelson will serve as pallbearers. Anyone wishing to leave a lasting memorial may give to the Cardwell Cemetery Fund, PO Box 488, Cardwell, MO 63829, Paragould First Baptist Church, or the charity of their choice. Webmaster Note: Name of Nettie's niece is suppose to be Mildred Statler, not Statlet.